Are you nuts for peanuts? Then you'll love this list of my Top 20 peanut candies. From old standbys like peanut brittle and peanut caramels to more adventurous recipes like potato chip peanut fudge, this collection of peanut candy recipes really showcases the delicious diversity of peanut candies. (c) 2013 Elizabeth LaBau, licensed to About.com, Inc.
Peanut Pretzel Toffee Truffles are easy peanut butter truffles with bits of crunchy toffee and salty pretzels. If you love sweet and salty flavors (and who doesn't?) then this is the candy for you! Every bite has a little crunch and a whole lot of flavor! This Honey Roasted Peanuts recipe produces golden brown nuts with a deep honey taste, a satisfying crunch, and a kiss of salt. This recipe for peanut butter cups produces a delicious chocolate shell filled with smooth, creamy peanut butter. They're reminiscent of Reese's cups, but the filling is smoother and less chalky. Love sweet and salty flavors? 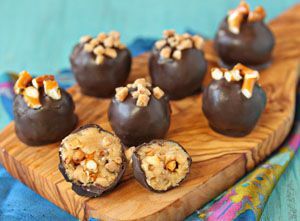 These Peanut Butter Pretzel Truffles are for you! Sweet, smooth chocolate truffles are filled with salty peanut butter and crunchy pretzel bits and topped with just a sprinkle of flaky sea salt. Have dessert for lunch today! This recipe features the great taste of peanut butter and jelly in a smooth, creamy fudge. (c) 2012 Elizabeth LaBau, licensed to About.com, Inc. Spiced Peanut Butter Fudge is an easy, sweet-and-salty fudge that gets a little kick from spices like cinnamon, ginger, and nutmeg. You can also add a dash of ground cayenne if you want some heat with your fudge. This toffee recipe, featuring honey, peanut butter, and whole peanuts, is a delicious twist on an old favorite. The honey adds a slight chewiness and a subtle note of sweetness to the double peanut flavor. Chocolate Peanut Butter Crunch Bars are a layered candy featuring a crispy chocolate base, a stripe of peanut butter fudge, a layer of chocolate-peanut fudge, and a smooth chocolate icing on top. What's the only thing better than traditional peanut butter chocolate cups? Adding a layer of tart, fruity jam on top of the peanut butter! Yes, your favorite sandwich gets a deluxe candy makeover in these sweet and salty bite-sized candies. This Peanut Caramel recipe features a sweet, chewy caramel packed with salty, crunchy peanuts. These are great on their own, but when they are dipped in chocolate they are positively decadent and resemble miniature candy bars. Peanut Butter Cup Bark has it all: a rich chocolate layer, peanut butter chips, crunchy peanut butter cookies, and a generous handful of peanut butter cups on top! A smooth, creamy peanut butter filling is sandwiched between two crispy graham crackers, and the whole package is dipped in chocolate. This makes a great afternoon snack! This great fudge recipe features three layers of delicious fudge: peanut butter fudge, banana fudge, and chocolate fudge. It's a fudge fit for a King! Nutter Butter Truffles are made from peanut-flavored cookie crumbs, cream cheese, and peanut butter. The soft centers are dipped in chocolate and topped with crushed peanuts for a sweet and salty treat. Just like grandma used to make! Peanut butter is the star ingredient in this easy chocolate-free fudge. Try using chunky peanut butter if you’d like an extra crunch. Peanut brittle is a classic with a crunchy texture and rich, nutty taste. This recipe uses peanuts and peanut butter for a double dose of nutty flavor. (c) 2009 Elizabeth LaBau, licensed to About.com, Inc. Potato Chips are the not-so-secret ingredient in this sweet and salty fudge. Although the peanut butter is the flavor that really shines, the chips add a nice subtle saltiness and crunch that’s irreplaceable. These smooth candies are rich with cream cheese and peanut butter and covered in a layer of decadent chocolate. The combination of tangy cream cheese, salty peanut butter, and semi-sweet chocolate is delicious! Tiger Fudge is a peanut butter and chocolate treat made from only three ingredients. It looks so sophisticated and tastes so good, no one will ever guess how easy it is to make. Does the Snickers Peanut Butter Squared Candybar Have the Same Crunch?